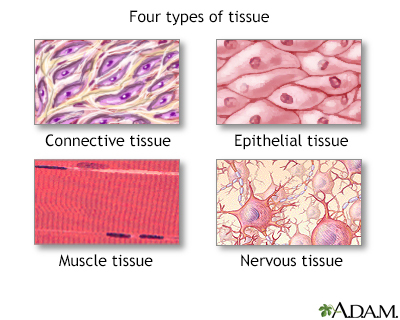 There are 4 basic types of tissue: connective tissue, epithelial tissue, muscle tissue, and nervous tissue. Connective tissue supports other tissues and binds them together (bone, blood, and lymph tissues). Epithelial tissue provides a covering (skin, the linings of the various passages inside the body). Muscle tissue includes striated (also called voluntary) muscles that move the skeleton, and smooth muscle, such as the muscles that surround the stomach. Nerve tissue is made up of nerve cells (neurons) and is used to carry "messages" to and from various parts of the body.